The answer, expressed as a percentage, is 1.28%. I know what you might be thinking: What happened to the content I’m used to reading here at Content Marketing Institute? 28% of brands have a documented content mission statement, according to annual research from Content Marketing Institute and MarketingProfs. 47% of companies published original research in the past 12 months, according to a report from Mantis Research. 15% of B2B brands implement influencer marketing via “consistent, integrated campaigns,” according to research from Traackr and Altimeter Group. 65% of bloggers publish guest posts on third-party websites, according to Orbit Media’s annual blogger survey. 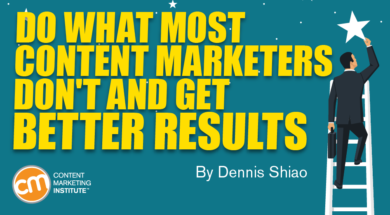 By implementing these four tactics (i.e., documented content mission statement, publishing original research, implementing influencer marketing, and writing guest posts for third-party sites), you can be in the top 1.28% of all organizations’ marketing teams. That was the premise of Andy Crestodina’s Content Marketing World session, Content Strategy and SEO for B2B Lead Generation. I’ll summarize Andy’s advice for each of the four tactics and connect the dots to tie them with B2B lead generation. A content marketing team without a documented content mission statement is like a nonprofit organization without a cause. For the 72% of brands without a documented content mission statement, I hope they find the time to create one this year. 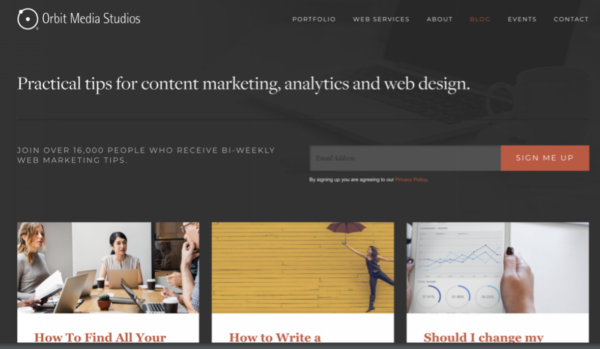 For Andy’s company, Orbit Media, the content mission statement is: Our content is where digital marketers find practical advice on content, analytics, and web design to get better results from their websites. A content mission statement helps two constituents: your target audience and your internal teams. The content mission statement indicates to visitors whether the site serves their goal – are they in the right place? For your internal teams (i.e., everyone who plays a role in planning, publishing, and promoting your content), the mission statement is inward-facing. It gets everyone on the same page. You can use the mission statement in editorial and content planning meetings. When an idea is proposed for an infographic, the team can ask whether it aligns with the mission statement. As the content team grows, the mission statement is a simple, yet effective onboarding vehicle. A content writer who joins an organization without a content mission statement immediately faces challenges and uncertainty. A new content writer at an organization with a content mission statement starts on solid footing. What type of content does well with shares and links? Original research. As Steve writes, some specific content types have a strong positive correlation of shares and links – research-backed content and opinion-forming journalism. “We found these content formats achieve both higher shares and significantly more links,” he says. 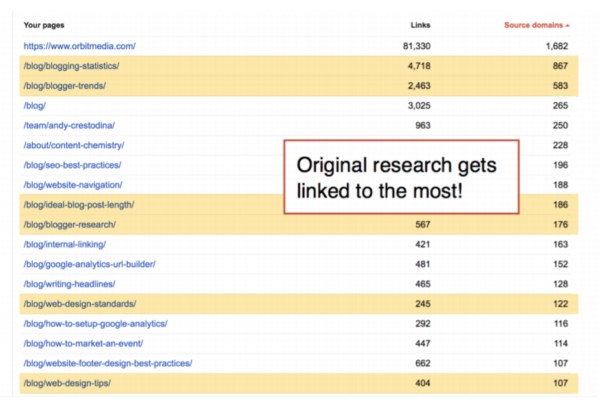 Articles featuring its original research received the most inbound links (i.e., other sites linking to those Orbit Media articles). Andy received this question from a client: “Should we have a search box on our website – is that standard?” As Andy wasn’t aware of any standards, he used the question as the impetus for observation-based research. 2 position in Google for a search on “web design standards,” ranking higher than the W3C (i.e., the World Wide Web Consortium). 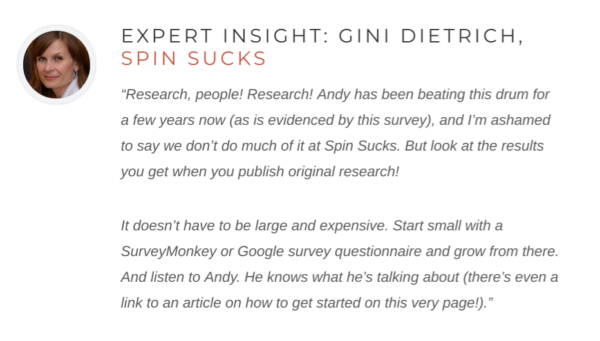 Andy didn’t have first-party data to answer a question – how much money do marketers make – but he knew who did. “Payscale.com and Glassdoor.com have a lot of data about this, right? 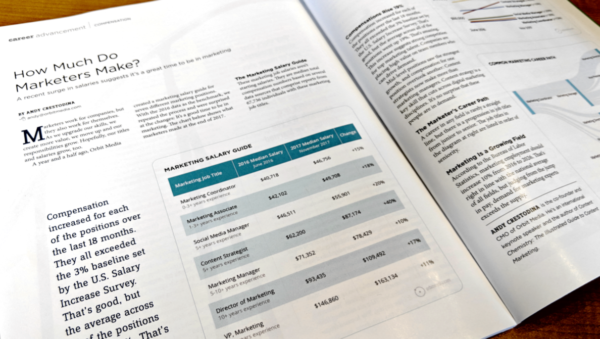 Self-reported data on compensation for marketers. So I go to those two sites and I download their data,” Andy explains. He presented the data by listing marketing job titles with their median salary. Eighteen months later, Andy analyzed a fresh set of data from the same sites. Now, he could show changes and trends for each job title. He curated the data to tell a story that the original sources didn’t – or at least didn’t report. “It’s kind of like (creating) news,” Andy says. An example of a big survey is Orbit Media’s annual blogger survey, which is in its fifth year. The survey began after Andy and team wondered, “How much does it take to write a blog post,” and couldn’t find an authoritative, data-backed answer on the web. Each year, Andy and team send the survey to over 1,000 bloggers. They analyze the data for the current year and show how metrics have changed from one year to the next. In addition, people will link to your site. To date, over 16,000 sites have linked to the blogger survey. Why? Because any author mentioning the average time to write a blog post wants to cite the authoritative source, which now is Orbit Media’s research. The blogger survey might be Orbit Media’s most time-consuming project of the year. For Andy, the effort is worth it. The time scales linearly; the results, however, grow exponentially. “I spend 120 hours every year on that survey. It’s a big job, but here’s my thesis. It’s maybe 10 times the amount of work of a typical project, but it generates 100 times the results,” he says. Given its effectiveness, what’s the best way to get influencers to share your content? According to Andy, it’s to create content with the influencers. Their contributions add quality and depth to your content – and, influencers are naturally inclined to promote it. They’re in the content, after all! “When influencers create your content with you, you’ve just leveraged a very powerful cognitive bias called reciprocity bias. Anyone who creates content with you is very likely to help you promote that content. An ally in creation is an ally in promotion,” Andy says. Like the example with Gini (above), the contributor quote serves to provide third-party validation to points made in the article. “I’m almost ready to make this just a rule, like an editorial standard. Don’t publish without a quote from a contributor, just like a journalist wouldn’t publish without a source,” Andy says. In an expert roundup, a set of influencers answers the same question. Their answers serve as the basis for your post. In a deep-dive interview, you ask a series of questions to a single influencer. I’ve found success by sending experts open-ended questions via email. They often answer in paragraphs for each question. Not only are their answers useful and insightful, they’re often rich with keywords. They help my page rank far more effectively than if I optimized the page myself. After all, the content is contributed from an expert whose knowledge is deeper than my own. You’re running for your town’s board of supervisors. You canvas the blocks in your neighborhood, asking people for their support. You blanket your street’s telephone poles with vote-for-me posters. You don’t, however, journey outside of your neighborhood. What are your chances of winning? Not good. There’s a world outside of your neighborhood, but you’re only known within it. In the content world, it’s like publishing only on your website and forgoing third-party sites. 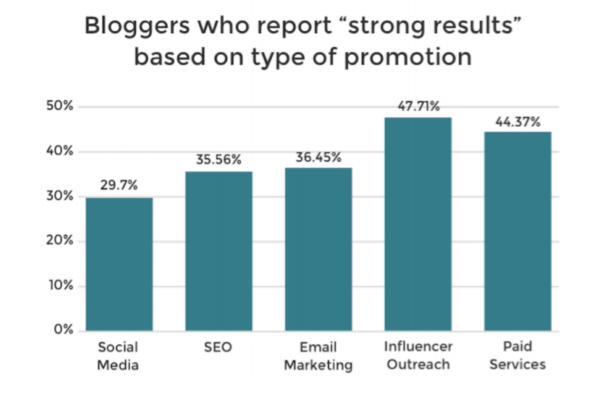 According to Orbit Media’s blogger survey, 34.5% of bloggers never publish guest blog posts. That’s a lost opportunity. As Andy explains, guest blogging exposes your brand and your content to new audiences. It gives you the opportunity to create inbound links to your website (e.g., links from your contributed post to relevant pages on your website). You’ll also likely receive strong social promotion by the hosts of your guest posts because their goal is to drive traffic to their site. Aaron’s pitch stands out from the many received by editors of major publications. “Aaron just gives them an amazingly beautifully crafted piece of content and they can just say yes to it. I love it,” Andy says. You’re implementing the four tactics covered in this article. You’re now in the top 1% of all marketing organizations. The leads should start rolling in while you’re sleeping, right? While 10,000 people may visit your site to view your infographic, 9,999 don’t have an active need for the products or services you provide. They enjoy the infographic, but they don’t fill out any forms. They don’t convert. Of all the visitors to a blog post on this site, only 0.03% converted to a business lead. Don’t expect your content marketing to lead directly to conversions. Instead, the mission of content marketing is to drive awareness, visibility, and authority, bolstering your chance of appearing when prospects search with commercial intent. TIP: Make sure your commercial-intent pages are optimized to drive the highest conversion possible. Are you ready to be the top 1%? You should be able to come up with your site’s content mission in one to two weeks. Technically, a team member can define the mission in less than an hour, but more time is needed to gain consensus and buy-in across the team. For guest blogging, allocate 25% of your content calendar to it. For every four posts you create, publish one on a third-party site. Influencer marketing and original research require dedicated resources. One option is to partner with agencies that specialize in these disciplines. They can provide consulting to help you get started or run the campaigns on your behalf. It’s time to jump in. Which of these tactics will you begin today? Gain insight like this from Andy Crestodina’s presentation in person in 2019. Make plans today to attend Content Marketing World Sept. 3-6.